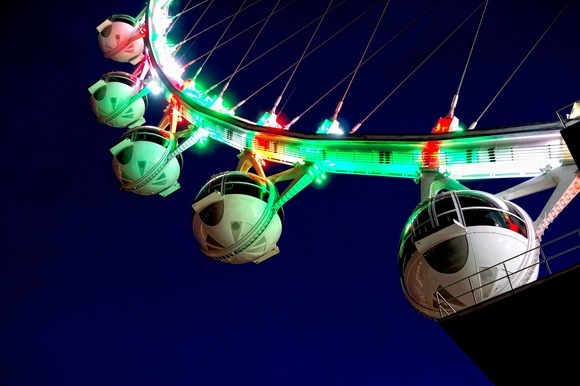 LAS VEGAS, Nevada — In March 2014, The LINQ Resort by Caesars Entertainment altered the Las Vegas skyline when it completed the world’s tallest observation wheel. The High Roller, shaped like a giant floating hoop, now rises above the cityscape of Las Vegas, illuminated from sunset throughout the night by fixtures from HARMAN’s Martin Professional’s Tripix range of products. Commissioned by Caesars Entertainment in 2009 with an overall vision to change the Las Vegas Skyline with a new iconic landmark, construction on the world’s tallest observation wheel began. On the lighting side of this extravagant architectural project, NYXdesign teamed up with Martin Professional, systems integrator 4Wall Entertainment and electrical contractors Bombard Electric. The installation includes 1,120 Tripix 300 fixtures, 1,008 Tripix Wash fixtures, 560 Tripix Power IP66 power supplies and four MAC Viper fixtures. One major challenge that had to be considered in the early stages of the project was to accommodate the user experience from both inside the cabins and from various angles and viewing distances make the lighting design successful from every possible perspective. The Tripix products were chosen because at the time it was the only fixture on the market with a converged light source, also known as a tri-color chip, meaning that when you look directly at the light source you only see the color that the fixtures is programmed to show. As visitors would be able to see directly into the light source from the cabins, a traditional RGB light source was not an option. The guidelines for the lighting design was that it had to respect the beauty and simplicity of the structure while at the same time embracing its kinetic qualities. In contrast to a lot of Las Vegas lighting, the design for the High Roller was not meant to be flashy and carnival-like. Even though the fixtures are moving around with the rim, it is possible to program the fixtures to make the wheel appear to be one color in the bottom half and another in the top half. The programming frequently returns to white to reestablish the pure form of the object and there are subtle design choices that may not all be perceived by spectators, but contribute to the overall perception of the design. As the sun goes down a slightly different time every day, there are 365 individual cues timed to actual sunset. It starts with a sequence designed to play from sunset to dark. When darkness falls another set of sequences carry on all through the night. Sets of special sequences are designed for holidays and special events, including, according to Holmes, an awesome one for Halloween. “The 2,000 Martin fixtures were individually mapped and numbered to provide the detail and variety we wanted in the programming,” said Holmes. “This formed the basis of the varied movement patterns and groups which play out in the programming for the wheel lighting." Holmes, working with programmer Jason Badger, created the initial wheel lighting sequences using an offline 3d visualizer, allowing the project team to further review and develop the feel and aesthetic of the programming in advance of installation. For onsite programming, a position was set up on a hotel balcony overlooking The High Roller. All the fixtures are wirelessly DMX-controlled and during this phase all the pre-programmed sequences were tested and more were developed. More than a year into its completion, many believe The High Roller has become an integral part of the Las Vegas Skyline with its beautiful shape and elegant lighting design, making it fully deserving of its status as the latest and greatest Vegas landmark.